Solar panels (or solar modules) are assemblies of individual solar cells housed within a supporting structure or frame. The solar cells (also known as Photovoltaic Cells or PV cells) generate electricity when they are exposed to light. As a general rule the more light (solar irradiance) which falls on the solar panel the more electricity is produced. It is a common misconception that heat helps generate electricity from solar panels, in fact the opposite is true, heat actually slightly decreases the electrical power of a solar panel. Generally a clear sunny day with a cool breeze will generate the most energy. There are a number of different technologies used to create solar panels. PV cells have been produced since the 1950s and for a long time crystalline silicon was the only technology used. However, over the past decade or so new technologies have been developed to compete with silicon. Thin film technology made huge progress in the 2000s and came very close to overtaking silicon as the main technology. However, just as thin film pricing started to beat silicon pricing, the cost of silicon cells plunged dramatically, largely on the back of mass production beginning in China. Now we are starting to see very high efficiencies (up to 21%) for monocrystalline silicon technology and the price is continuously falling. Other technologies are also coming on board such as poly and monocrystalline PERC cells and we will see prices continue to drop and efficiencies continue to rise on the back of the new developments. Silicon produced as a single crystal with a continuous internal structure is used for mono-crystalline cells. This type of silicon is manufactured into a large cylindrical ingot and then thinly sliced to create wafer cells which are usually very dark blue or black in colour. These manufacturing processes demand greater resources than poly-crystalline cells and so generally cost more, but do offer slightly higher efficiency. Monocrystalline PERC cell (Passivated Emitter and Rear Cell) is a more advanced version of the mono cell which uses additional layers on the rear side of the cell to help capture more energy and increase efficiency. Learn more about PERC and the other leading cell technologies in our solar cell technology review article. More correctly known as multi-crystalline, the silicon cell made from multiple crystals can give a distinct flaky look and is often blue in appearance. This type of silicon can be manufactured in square ingots and is less resource intensive to produce.. The process of producing poly-crystalline wafers has improved to a stage where the efficiency and performance of a polycrystalline panel is very comparable to that of a monocrystalline panel but at a slightly cheaper cost. Made by deposition of exceptionally thin layers of photovoltaic material on a substrate, thin film technology employs a range of materials including silicon, cadmium, copper, amongst others to create a solar cell. Both rigid and flexible thin-film modules can be created, allowing solar generation to be better integrated into products and buildings compared to crystalline silicon. Thin-film solar panels are not longer available in most countries due to the higher cost and lower efficiency compared with the modern mono and poly silicon panels. 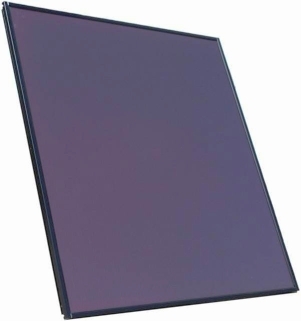 Thin film Amorphous solar modules are now rarely used due to the lower efficiency. Most photovoltaic cells use one main material with specially chosen impurities added, to convert energy from the light into electricity. These cells can only use a certain part of the light spectrum (i.e. specific wavelength, or colour) to convert light energy to electricity. Multi-junction cells on the other hand have different material combinations that allow them to convert more of the received light energy into electricity. The cells are produced in a similar manner to thin-film cells, but are more complex to manufacture and are much more expensive. MJ cells can achieve a significantly higher efficiency than conventional solar cells (up to 35% compared to 15-25%). These cells are only used for very specific purposes and still in development, so not available to the general public. Fraunhofer ISE is the largest solar research institute in Europe and has recently developed a new silicon-based multi-junction solar cell together with the company EV Group (EVG) with an incredible 33.3% conversion efficiency.